Introducing AudioBulb: a wireless music and lighting system that revolutionizes how you play music throughout your home or office. Designed to work with iPods, iPhones, or an auxiliary input source, the patented idea came from the concept to combine something found in virtually every room (a light socket) with something people want in every room (music and light). 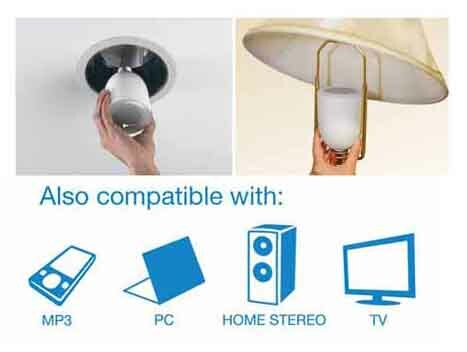 - Simply twist AudioBulb into any light socket or lamp and power up. - Connect your audio source via Apple 30-pin or Aux-In to the standalone base and press play. 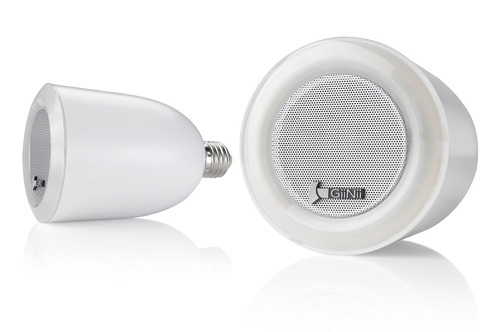 - Listen to wireless music from up to 8 bulbs throughout any environment in minutes. We took away the wires, so why tether you to the docking station? Complete control is always at your fingertips with the included remote. You not only can modify the music, but also control the lighting and 4-stage dimmer so you can create the moods to match you playlist. AudioBulb lets you create two different zones, and configuring zones is about as simple as the initial set-up. Imagine sleeping in peace and quiet as other household members are up and about jamming to their favorite tunes in the next room. And, with a range of 50 to 100 feet (depending on environment) AudioBulb can reach from the entryway to the patio from a single base station. AudioBulb also functions as a super-efficient LED light bulb - with or without music - that lasts for years with normal use (not like a typical light bulb that burns out quickly). You can even use the four-stage dimmer to create the lighting environment you want. With AudioBulb, you get a pristine audio and light solution for the fraction of the cost of a typical distributed audio system or other solutions.